Like numerous tribes of the northern plains, the landless and reservationless Metis, found themselves scattered to both sides of the border after the Northwest Rebellion of 1885. Even today, Metis descendants cannot tell which side of the border their forebears were born on. Montana’s portion of the International boundary runs 545 miles, long enough for us to share borders with three Canadian provinces, the only state in the union with that distinction. In many places, the border is just a fence, less of a place than an idea. From a drone’s eye view, the physical boundary line strikes a straight east-west trajectory. Truth is, the line courses dizzying ups and down as it follows the contours of the landscape across Montana, yielding to peaks and declivities, gullies and coulees, canyons and creeks and mounting the Continental Divide. The peaceful border may seem benign in the ideology between two countries, but it can be brutal terrain. To explore out of the way places near “the line” demands patience, lots of windshield time, a dependable vehicle and plenty of curiosity. But the rewards are huge, given that destinations for Montana adventure travelers are of less importance than what can be found along the way. Here are worthy places to plug into your GPS. Don’t forget your medicine bundle and “possibles” bag. "In summer season, no trip to the North Fork is complete without a stop at the iconic Polebridge Mercantile." North toward the border from Columbia Falls, on gravel county road 486 drive into the North Fork region of the Flathead National Forest. It’s a region where only a few hardy locals carve out log-cabin lifestyles. You bump your way north for 55 miles through spectacular old-growth forests and open meadows. Round a corner adjacent to the North Fork of the Flathead river. And there it is: The International Boundary, as abrupt as it is unremarkable. There sit two utilitarian-like shuttered buildings, one on each side of the 30-foot-wide “boundary swath” through the trees. Nobody’s there. Still, you’re probably being watched. The U.S. border station is festooned with all kinds of antennae’s and electronic roof-top gizmos aimed at detecting who’s naughty and nice. A small steel gate marks the end of the road. Tip: Top off your fuel tank. Air up your spare. Bring some tools. 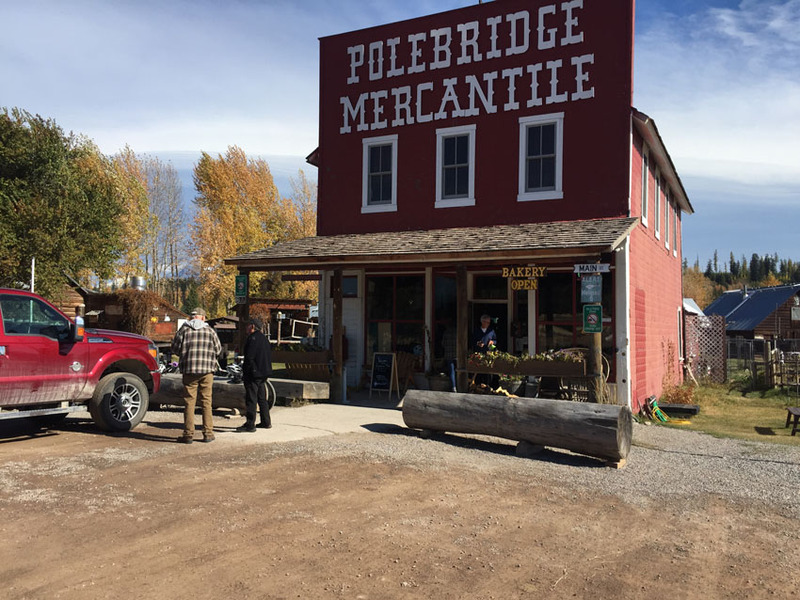 In summer season, no trip to the North Fork is complete without a stop at the iconic Polebridge Mercantile. Enjoy spirits and home-cooked food at the Northern Lights Saloon next door. Nearby is the only entrance station to Glacier National Park’s North Fork District at Polebridge. From the top of West Butte, the tallest peak in the Sweet Grass Hills, you can see it—a foreign country. Out from the summit, the timbered north slopes give way to Alberta unencumbered by treaties or fences. Somewhere down there is the boundary, blending into forests, prairies and harvested cropland. It’s just not distinctive, which is what you would wish for as a dividing line between two peaceful nations. In the very early years of the 19th century rumors of rich gold finds in the Hills set off a brief rush to the region. Most of the “boomers” were from Great Falls and loaded their freight wagons with tools and hope and headed for the hills, literally. The Great Falls Tribune boasted of “provable traces of great wealth” in the creeks surrounding the three buttes and predicted that small miner’s camps would soon be “...platted towns of prosperity.” Instead ranching and farming have yielded more enduring wealth. Hidden in the brush-choked coulees are clear springs that give life to an astonishing collection of wild critters: elk, upland birds, coyotes, badgers, and prairie songbirds. Most of the land around the Hills is private. Farmers and ranchers have tilled and grazed here for over 130 years when the federal government collapsed the size of the Blackfeet Indian Reservation to make room for homesteaders and settlers. Tip: Because of the widespread private property, and with any sacred Native sites, ask permission and respect rights. Except for a few scattered BLM and “school” sections, there is very little public land in the “Hills”. Use caution on dirt roads that can turn into gumbo with any passing rain storm. Best approach to the Hills is north on Interstate 15 from Shelby to Sunburst, then east on County Road 552. A crossing into Canada can be found at the remote Whitlash port of entry. President Franklin Roosevelt established the preserve in 1936 as part of the broad campaign of public works projects to create jobs and protect natural areas. Today, it is a magnet for bird lovers. Here will be found uncommon species like a Ruddy Turnstone, Yellow-billed Cuckoo, Wilson’s Warbler, Hoary Redpoll and dozens of others. Bowdoin attracts migratory birds navigating north and south each year. 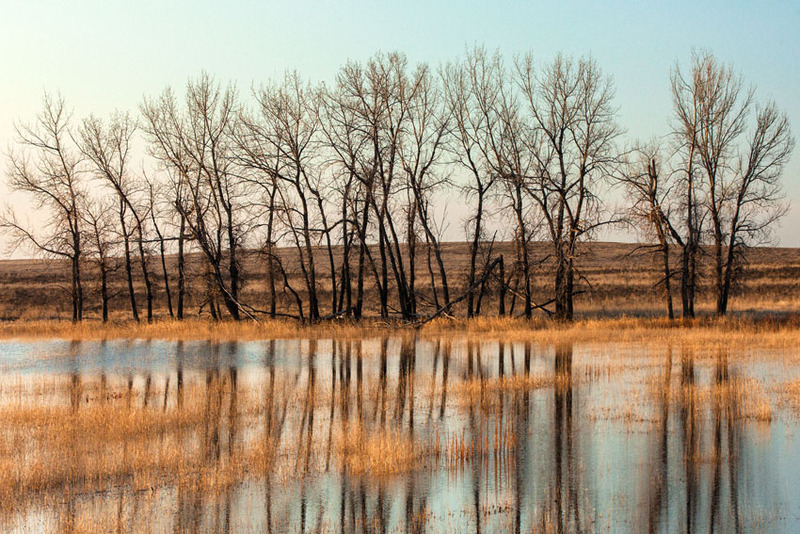 In addition just about every other Plains species of animal life frequent the shoreline-prairie interface zones: muskrats, deer, badger, ground squirrels, coyotes, voles, and rabbits. Tip: Just a bump off Highway 2 and east of Malta Montana, a two-track “auto tour” road encircles the Bowdoin reservoir. Like most Montana places, timing of visits is the key. Seasons bring ever-changing variety to the preserve. To really appreciate Bowdoin, get out and walk, stop and listen. Bring binoculars or spotting scopes and tripods. Visit in early morning and evening and soak in the sounds and smells, embracing the prairie breezes. Somewhere out there is a Painted Turtle or Red Fox. 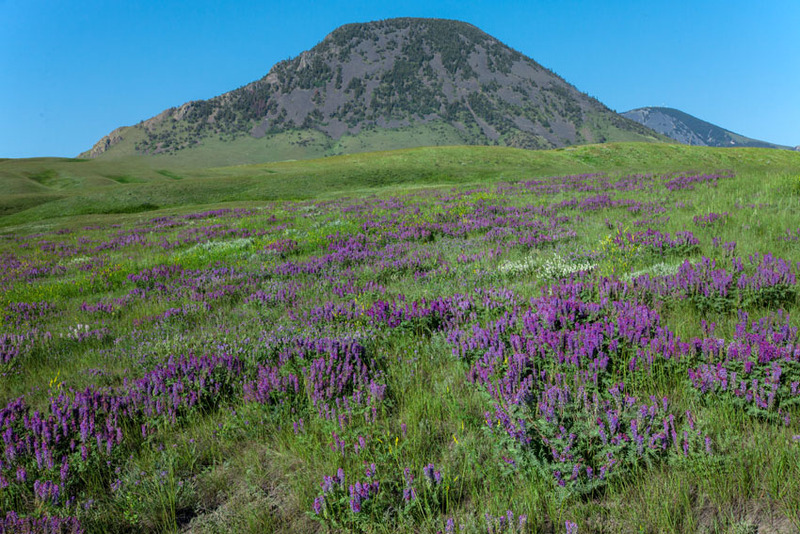 If it is a more remote landscape you are looking for along the Medicine Line it’s hard to beat the Nature Conservancy’s Northern Montana’s Prairies Grasslands Conservation Program. The rolling hills are home to some of the last remaining undeveloped grasslands in the North American Continent; the broad sweeps and swoops of Phillips County spread northward to kiss the Alberta border. For historical reference, reach down and pick up a handful of dirt from the hills and you are holding a piece of 1803 history, evidence of the bargain-basement deal Thomas Jefferson sealed with France, the Louisiana Purchase. The Nature Conservancy created the preserve through easements, shared leases and purchases of large chunks of undeveloped short-grass prairie. Ground zero for all this is the Conservancy’s 60,000-acre Matador Ranch. There, in a unique alliance, cattle producers can trade grazing practices that preserve soil and vegetation for the right to run cattle on portions of the ranch. It is win-win altogether. Discounted grazing fees are offered for ranchers who practice wildlife-friendly fencing, weed control and hands-off encroachment of prairie dog towns, home to the Black-Tailed Ferret, rarest mammal in North America. Tip: Don’t look for a visitor center or interpretive signs. Just drive north of Dodson, Montana, to take in the unspeakably wild grasslands north of Highway 2 all the way to “the line.” You’ll find it. Ghost towns are a pretty big draw for many Montanans and tourists, but St. Marie is not one you would find on many folk’s top 10 lists. It should be because it only went empty 50 years ago. From 1957 to 1968, the Glasgow Air Base operated as a Cold War deterrent to Soviet air invasion coming over Canada. The U.S. Air Force selected the site because of its clear skies, flat terrain, and strategic northern location tucked just 48 miles south of the Canadian line. Squadrons of Voodoo F101-B fighter jets patrolled the skies and to support the mission, the town was constructed to house the projected 7,000 airmen and their families. Now the gigantic 13,500-foot-long runway, aircraft hangers, apartments, homes, and barracks—are all abandoned. Tip: To find this town, drive north of Glasgow for 16 miles on highway 24. Perhaps no place along the 49th parallel evokes the agony associated with Native people’s identity with the “line” more than the Bear Paw Battlefield south of Chinook. Chief Joseph’s band of 700 Nez Perce and their prized 800 horses made a run for the border in the summer of 1877, pursued by two cavalry units led by Nelson Miles and Oliver O. Howard. After a long 1,200-mile escape from their reservations in Idaho through Montana, they struck north from Yellowstone Park and sought relief across the Medicine Line. Either thinking they had reached Canada or just because they were too exhausted to march any more, they huddled in an early fall snowstorm alongside Snake Creek to rest. There they were overtaken. Amidst gunfire. Some of Joseph’s band escaped one night and made it to Canada. Joseph and his followers, in rags and tattered blankets, surrendered on October 5, 1877—just 44 miles short of freedom. 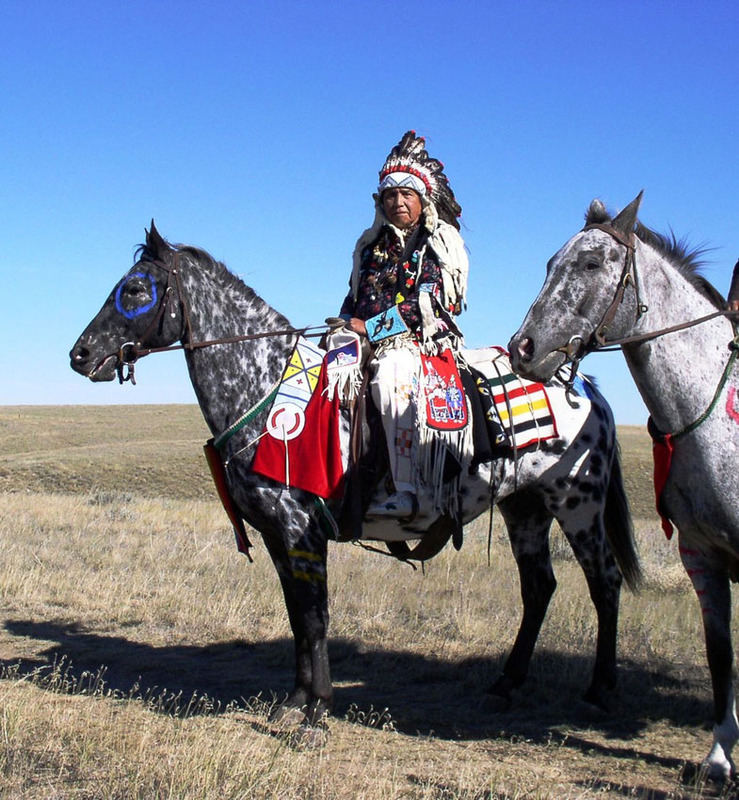 Tips: The Nez Perce National Battlefield Historic Site is administered by the National Park Service in an interpretive center partnered with the Blaine County Historical Museum in Chinook Montana. The battlefield is 16 miles south of town on paved highway 40. Guided tours with rangers are available in the summer but in the off season you’ll likely be the only vehicle in the parking lot. A 1.5-mile self-guided trail encircles the battle site. Visitors can see the places where soldiers dug rifle pits, where Joseph’s lodge was and where Indians fell adjacent to bullet-splattered rocks. Native visitors have placed offerings, not to be disturbed, at locations where Indians were camped or fell that include tobacco, beads, coins, strips of cloth, and dried food. The site is free and open year-round, sunrise to sunset. There you have it—a roundup of sites you can visit along the Medicine Line.